The Technology Tournament for teams of Secondary Schoolchildren. The 2018 Technology Tournament took place on 23rd February at the Chiltern Hills Academy, Chesham. 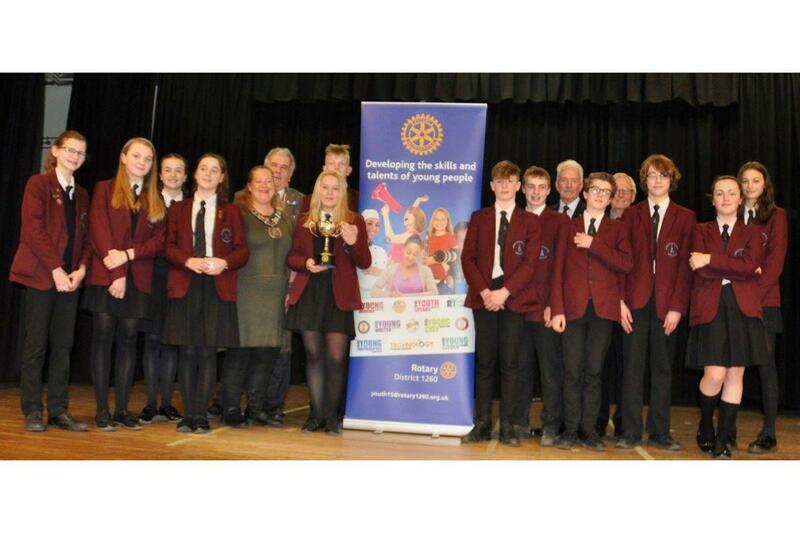 A clean sweep of all categories for John Colet School, Wendover, in the Amersham, Chesham and Great Missenden Rotary Britain and Ireland Technology Tournament held at the Chiltern Hills Academy, Chesham. The event was held on the 113th anniversary of the foundation of Rotary. The event was attended by the Mayor of Amersham, Councillor Clive Morgan and the Mayor of Chesham, Councillor Emily Culverhouse. Technology Tournaments are one-day events for teams of four students from local schools and colleges. Under supervised tournament conditions, students collectively work together to solve the previously unseen task whilst using oral, written and graphical communications skills to compile a project portfolio. The Tournament was introduced to the Rotary Club of Chesham by the late Derek Upcott, who joined us from the Luton Club over 20 years ago. Derek made a point of interviewing our local head teachers, and ensuring that the project fitted in with their curriculum. The project has now spread throughout the country. Youngsters in teams of four are asked to make a device out of a small range of simple ingredients. Marks are given for teamwork, planning, and a portfolio, as well as the success of the device. It is called a Tournament, rather than a competition, because it is hoped that all the teams will achieve a measure of success. There are different levels of difficulty, for different age groups. Teachers are encouraged to form a team. One previous task involved moving a load of provisions across a crocodile infested river, dropping them by remote control, with the device returning. On another occasion they were asked to remove a “radioactive” sphere from an awkwardly shaped box, never approaching nearer than one meter. To the right is a photo of an attempt to make a bridge which takes a substantial weight, using only paper straws and thick paper. It is extraordinary how rigid paper can become if it is carefully folded into corrugations. The task aims to test the collective knowledge, ingenuity, innovation and manual skills of the four students and their ability to work as a team. There are three age levels for team members; foundation, intermediate or advanced. The degree of complexity of the task is increased at each age level. The day culminates in a testing session when each team demonstrates their best solution to the task and is judged against the efforts of the competing teams in their age group. Students who successfully participate are eligible to apply for a CREST Discovery Award. For several years the Tournament was held at the Leisure Centre, White Hill, in collaboration with the neighbouring Chesham High School, now Chesham Grammar. Last year it was held at the smart new buildings of Chiltern Hill Academy, on 23rd February 2018. We were fortunate to have Ray Payne as our chief judge: he is not only absurdly over-qualified for the job, but he has the knack of explaining how the tasks that they have undertaken apply to problems they will face in the real world.